Hi guys. I've got a vintage clodbuster and it only gets a run now and again. It's running a mechanical speed controller and is just how I bought it in the late 80's. I'd like to have the fun of running one guilt free and not worry about damaging the old thing. First I thought, get a re-re clod buster. Then I thought I'd like to modify that by making it just rear wheel drive and then more ideas popped into my head etc.... you know how it gets when you think of a new project. Plus Clod projects can empty a wallet fast, I've seen how far these builds can go. Anyway I've got to my latest idea. I've got a WT01 and I originally built it to have a monster beetle shell because at the time the re-re hadn't been released. Now it has though I'll buy the re-re monster beetle and this wt01 can be a new project. So I'd like to get a clodbuster shell or polycarbonate version for weight saving and some clodbuster style rims and tyres. Firstly I'm wondering is the gearing going to be okay with such large tyres (running a 4000kv motor) and secondly if it is are there an alternative to the clodbuster tyres and rims (same size) with a 12mm hex fitment. I realise it may be from another manufacturer it's just the size and look I'm after. So hopefully this will look like a clod as it's driving around but will handle and go that bit better and not have the worry about damaging my original. The axial BKT set might be a bit less "soooo big" at 140mm tall and 75mm wide 2.2" wheel. Blackfoot/MB rubber comes in at 135 x 50 or so. As you know, Clod tires are big. for comparison the numbers are, 165 mm tall and maybe 100 mm wide. They are perfect on a WT-01 as thats what this is. I also had them on two other WT-01's I sold as rollers with the original tires and the last set went for £31 plus post. Thanks for mentioning the BKT tyres anthony. They look great, definitely bigger and chunkier than the monster spikes that come with the kit. While looking around I've found some HPI mud thrashers which are a step up in size from the monster spikes too but slightly smaller than the BKT ones. @Terz1 not Clod tires, I got them from another forum member and cant recall what they are but they were perfect. Body had to be lifted but steering no issues and yes fit straight to original rims. They have foam inserts and that truck is over a year old with no noticeable wear. If you search WT-01 threads you will find a link to them. Thanks Baddon. I just tried my clod tyres on my wt01 rims. I say tried but I really just dropped the rim through the clod tyre . Never touched the sides lol. I was trying to see the writing on the side of the tyres in your pic but couldn't make it out. I'll try a wt01 search like you said. Thanks for the link I just found the same thing on ebay, they're from china. 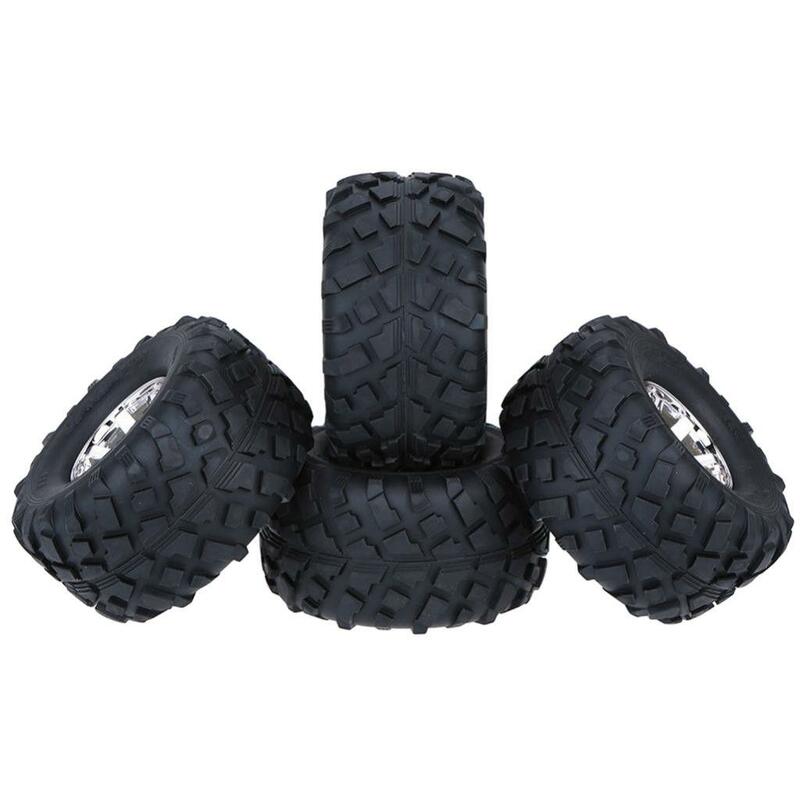 Just seen a guy using some on a wt01 on youtube too, in his description he says they're hobbywing monster truck tyres 74-54-56 so look like the same tyre. Definitely give it that monster truck/clodbuster look with the right shell . Saying that the shell this guy is using look amazing! Again thanks for taking the time to find the pics. Found them at hobbyking too. A trick to get Clod tires on there involves cutting the WT01 wheel in half and then bolting/gluing the inner half into a Clod rim. I'd caution against putting Clod tires on the WT01. It can be done, but compared to the Clod, the WT01 is in no way built for those kind of tires. 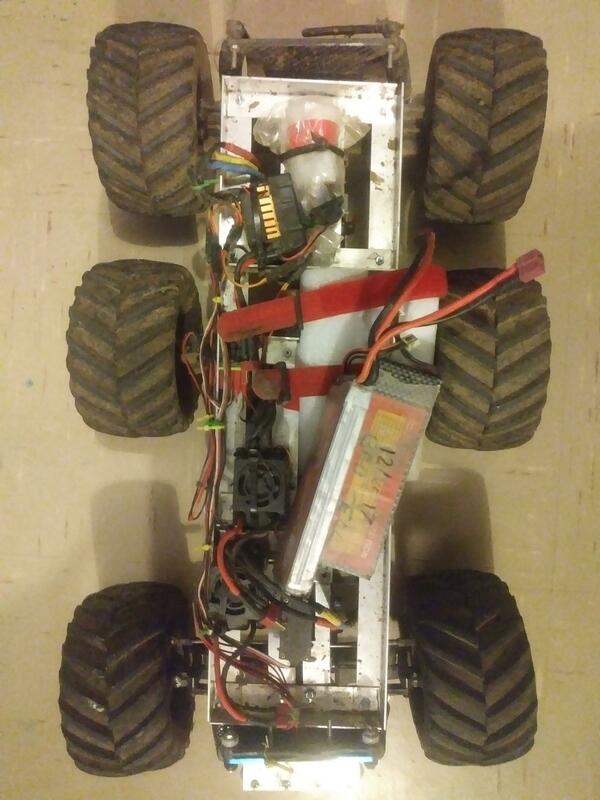 I've had Wheely King tires mounted on my WR01 with twin HPI Firebolt on 8.4v. It was simply borderline to what the truck could handle. The 2-piece suspension arms are pliable by nature and twisted everywhere with that kind of power driving those big tires. The truck was all over the place. It WAS fun however. The steering definitely needed stabilized. I did manage to stiffen up the arms by stuffing them full of a 2 part epoxy putty. 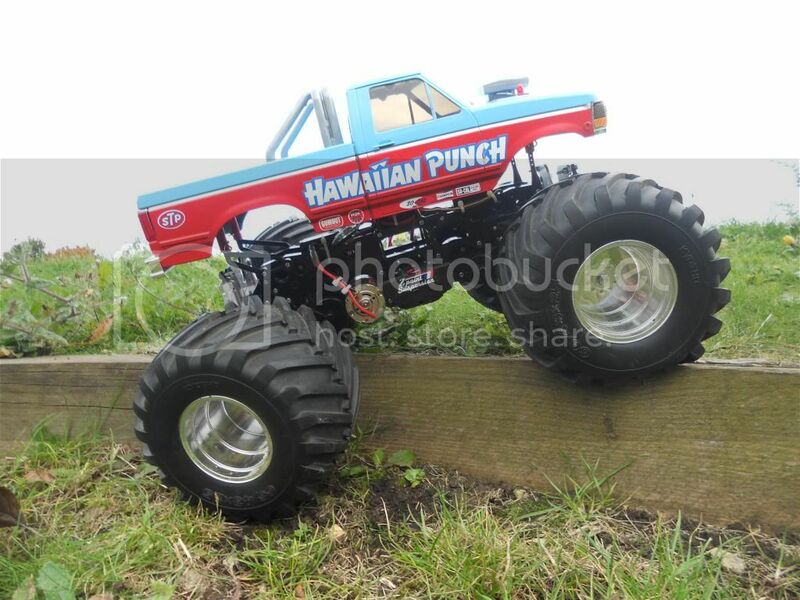 I'm getting vague flashbacks of a Hawaiian Punch liveried truck with clod wheels, who's was that? You have a good memory! It was waaaay back, before my time here in 2012 and belonged to @bromvw. Don't let my wife see that, she'll ask why I couldn't do that to one of my Dual Hunters and move on the Agrios! Thanks for the info Saito. From what you and others have said I'll go for the hobbywing monster truck tyres. They definitely give it that monster truck look and wouldn't put as much strain on the suspension arms like you said. I remember the Hawaiian Punch truck too. Hard to believe it was so many years ago now. 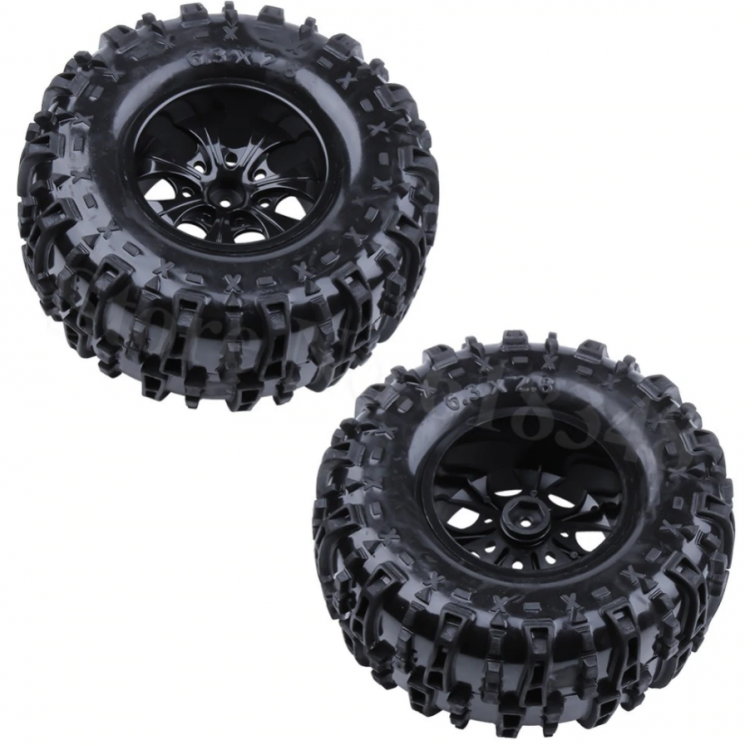 He mentioned he used kyosho wheels and they were similar to to clod wheel fitments. He did a great job. found some more photos for you. Here's another thumbs up for these tyres. I been bashing with them for 10months and they are still in very good condition. I would have to say they are my longest lasting tyre so far. The sidewalls are quite soft but I haven't glued them so maybe they will tear if I do glue them on. This is under brushless power though. I believe the truck was built by @bromvw . He was a pretty active member on here for a while and then, like so many others, disappeared without a trace. Miss him. I had a look around and this is the cheapest price I can see the big chevron tyres, about £17.20 with postage for 4, there's a small seller discount applied at checkout. If you use the app you'll get another small discount I think. Those tyres look great on your trucks @Baddon and they're defintely a step up in size from those monster spikes . Good to hear they wear well too @wolfdogstinkus . I'll be running brushless power too, a 4000kv system so it's good to know they've handled the power so well . And cheers for looking up all those tyres @nowinaminute . I like the first two you found but that chevron style is just what I had in mind. That's a great price you found too. If I join Ali express I get $3 dollars of coupons too. Looks like a bargain. Thanks for all the info guys. I've been busy with work and it was great to come back to all this info and pics. It's weekend now so i can get ordering stuff and planning the build. Another option for (close to) Clod sized tires is old Imex Jumbo Dawgs. I've got two sets of them. The rears have Blackfoot/Monster Beetle hub pattern. The size is close, but the rims are smaller. So the tires are chunkier. They show up on Ebay every now and then, with different descriptions. Not everybody knows what they are.